Homemade Taco Seasoning. Easy to make. Easy to store in the pantry. And much more flavorful and fresh than store bought. Homemade is always better. Ever since I discovered smoked paprika a few years ago, I’ve gone crazy using it. And sprinkling some in taco seasoning is no exception. If you’d like substitute this homemade mixture for any Mexican recipe, just use about 3 tablespoons instead of a store purchased packet. It brings a whole new level of earthy depth to any Mexican dish. And just look at that bold color. When using this for tacos, just add 3 tablespoons of this seasoning to one pound of browned ground beef. Add a cup of water and simmer for about 20 minutes. Taste and add more seasoning if desired. The secret that makes this a great seasoning is Mexican Oregano and a good quality Hot Smoked Paprika. 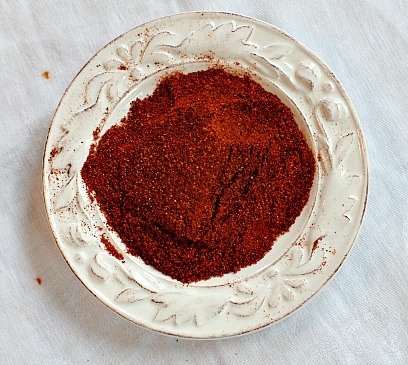 And of course, my favorite ingredient, New Mexico Red Chile Powder. That one you may not have on your shelf, so just substitute cayenne pepper or Ancho Chile Powder. I’d advise against Chipotle Chile powder due to it’s smoky flavor. The smoked paprika is already taking care of that. I hope you give this simple Homemade Taco Seasoning recipe a try. And if you do, please come back and let me know how you liked it and give the recipe a star rating. Your feedback is valuable to me for developing future recipes. And if you make this taco seasoning, please let me know how you used it, I’m always looking for new ideas. Put all the ingredients in a small jar and shake to combine. Store in an airtight container for up to 1 month. To use, break up 1 pound of ground beef in a wide skillet over medium heat. As soon as it starts to sizzle, sprinkle on 2-3 tablespoon of this taco seasoning and add 1 cup water. Continue stirring. As moisture cooks out of the meat and simmers, it will be thickened by the cornstarch. Looking for other ways to use this seasoning other than for ground beef tacos?